Sea level rise whiplash | Climate Etc. Some recent sea level rise publications, with implications for how we think about the worst case scenario for the 21st century. Less than 3 months ago, I published my Special Report on Sea Level and Climate Change. I remarked on what a fast moving field this was, particularly with regards to the ice sheet dynamics. This past week has seen the publication of 3 new papers that substantially change our thinking on the worst case scenario for the 21st century. In 2016, a paper by Deconto and Pollard grabbed headlines with the finding that Antarctic ice was at risk from “marine ice-cliff instability”, which would see towering cliffs of glacier ice collapse into the ocean under their own weight. The 2016 study generated a lot of media coverage, even making the frontpage of the New York Times. It became the most talked-about climate paper of that year. The past few weeks have seen publication of a number of relevant papers, that point to a much lower sea level rise than predicted by DeConto and Pollard (2016). 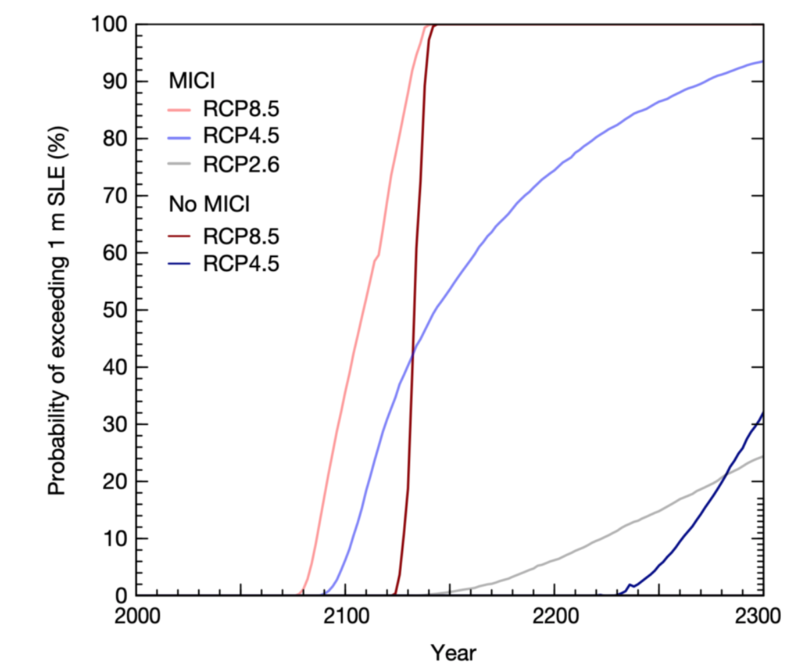 Only for the borderline impossible RCP8.5 scenario with MICI, is there about a 50% chance of exceeding 1 m sea level rise in the 21st century. My original motivation for assessing the RCP8.5 scenario was that all of the really catastrophic sea level rise scenarios for the 21st century seem to depend on rather extreme (if not impossible) levels of CO2 and radiative forcing. If you take away RCP8.5 scenarios, SLR is not so alarming, at least on the time scale of the 21st century. Of the three papers, the Whitehouse one may be the most important (the other two seem part of the WAIS MICI whiplash phenomena – who knows what the next round of papers will show). However, Whitehouse et al. has gotten zero press attention. Perhaps because youou have to dig deep to figure out the broader climate implications of the paper. Hopefully my little blog post will draw some extra attention to the this paper. 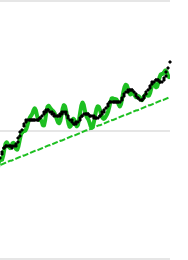 After the extreme alarm associated with the 2016 DeConto and Pollard paper, we are seeing a whiplash back to more reasonable (and less alarming values) of 21st century sea level rise. DeConto presented a talk at AGU on the latest simulations, apparently they are also predicting lower sea level rise from MICI, but the paper is under review and they are not publicly commenting on it yet. The rapidity of the ice sheet instability research reminds me of the heyday in 2006 of the hurricane and global warming research, with weekly whiplash between alarming papers and nothing-here-to-see papers. I assume that this research topic will generally converge to an agreed upon list of things we don’t know, so we can better constrain the worst case sea level rise scenario for the 21st century. In any event, to me this seems like the most interesting, fast moving and important topic in climate research right now. This entry was posted in Oceans. Bookmark the permalink. 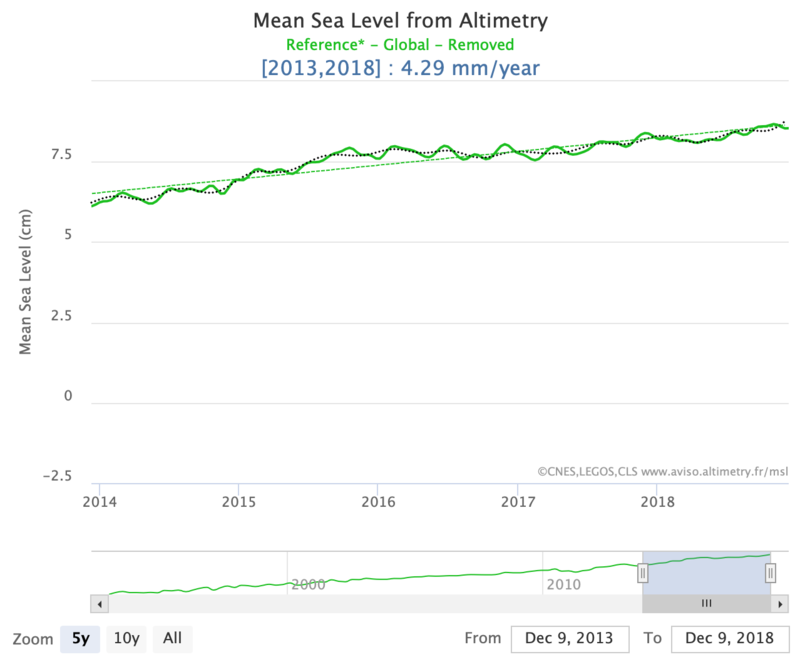 Meanwhile from September 2015 to September 2018 the increase in sea level was just 6.33 mm, or 2.1 mm/year. The reality couldn’t be more different than the fiction. I know. Can you believe it? 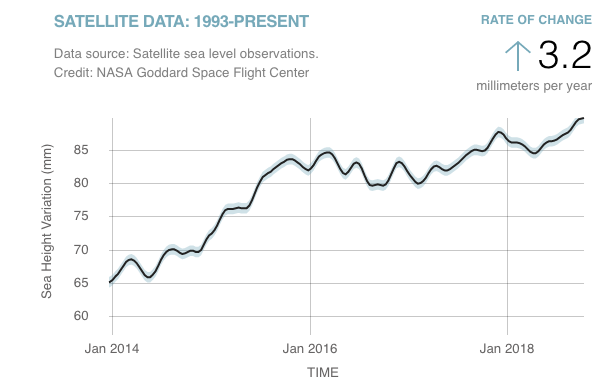 There has been so little sea level rise since late 2015. All those predictions are going to fail like by a meter too high. 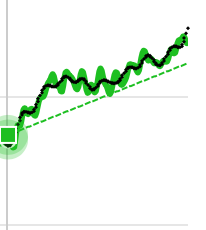 By the way, I did predict that sea level rise was going to decelerate, according to the Stadium Wave hypothesis. It is too early to say, but it is moving in the right direction. I recall JCH on these pages a few months back smacking his lips over the upcoming el nino. Seems it petered out, so now he is smacking his lips over the AMO (actually he used only SST, not AMO), but whatever. It’s difficult to know if you’re winning if you can’t name the game. The big Niña is coming in 2021. 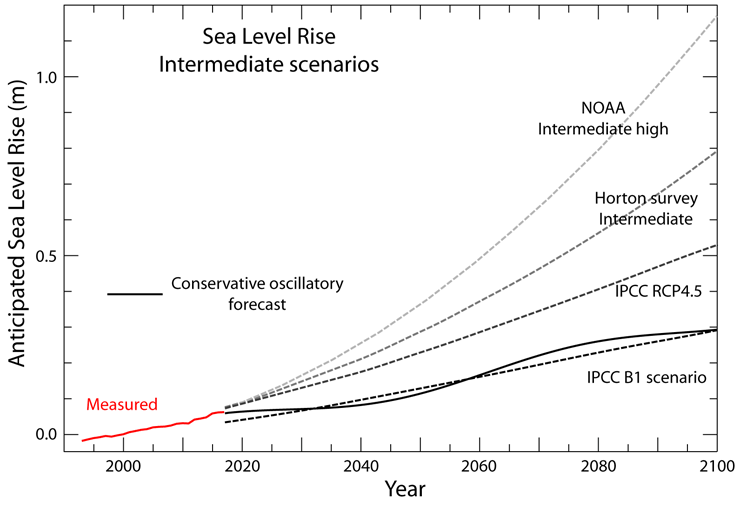 We might see a mini-pause of a few years in sea level rise if it doesn’t rise enough before. Mail sent. It is too long for a comment. Professor Curry was supposedly going to be unable to predict a 2018 El Niño*, but you can predict a 2021 La Niña event. Amazing. So say it comes true. I predict it will be a huge disappointment to you as a La Niña doesn’t do what what you want. Because it eventually gets blown off the map by an El Niño, and they both are nothing but wiggles around a longterm trend. * it’s a not a cinch the last ONI reporting period for ONI will exceed .5 ℃. If not, no 2018 El Niño. but you can predict a 2021 La Niña event. Amazing. It is actually easy if you know what causes them. But very few people do. I predict it will be a huge disappointment to you as a La Niña doesn’t do what what you want. Because it eventually gets blown off the map by an El Niño, and they both are nothing but wiggles around a longterm trend. Your predictions aren’t worth anything, because you don’t know anything about ENSO. There should be a major El Nino episode roughly 1 year past sunspot minimum at a major low in the Solar Wind speed, as with the SW speed lows in 1997 and 2009 and subsequent El Nino episodes. My reckoning for sunspot minimum based upon historic patterns, is between mid 2020 and early 2021. Which would place the El Nino peaking in Dec 2020 or Dec 2021. I doubt that a following La Nina would be major, and a doubling of mean El Nino episode frequency is normal during the main phase of a centennial solar minimum. I wouldn’t expect the Nino regime to shift until from around 2025 at the next sunspot cycle maximum. I don’t make ENSO predictions. Then there was the time Professor Curry did not believe me when I pointed out indications a major spike in sea level had commenced. The problem, Ulric Lyons, is that to see some sort of correlation between solar wind speed and oceanic Niño index requires some skill that I do not possess. I’ll take it as another one of your spurious relations. Demeaning hearsay is typically projection. There are many points of good correlation between low solar wind speed and El Nino episodes, though your presentation of them certainly lacked skill. A chart showing ENSO phases in blue/red bands rather than ONI intensity would be far easier to read. The reasoning is that weaker solar wind increases negative NAO/AO which is directly associated with slower trade winds. Notable exceptions were during larger volcanic events, and the 2015-16 super El Nino. Sure. And as many points of bad correlation. You are a victim of data selection. Next you make ad hoc explanations for why the points of bad correlation have to be disregarded. Your solar wind speed/Niño hypothesis doesn’t hold water. There is indeed a correlation between solar wind and polar surface pressure. And between the cumulative NAO index – based on polar surface pressure – and AMO and AMOC – albeit with a very short series for the latter. I will do a cumulative AAO and cumulative MEI. 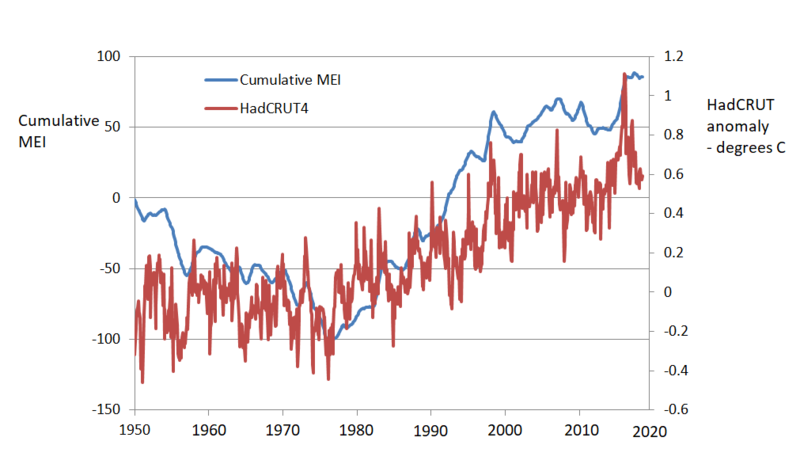 But here’s a cumulative MEI and surface temperature. But there is no one to one correspondence between specific solar metrics and the state of these nonlinear oscillators. I suggest that solar activity biases the system to one chaotically evolving state space or another as tremendous energies bounce around powerful sub-systems. It is the mechanisms that are more interesting – and simple graphology in a system that has teleconnections everywhere doesn’t do that justice. Only three, the rest are all associated with declining and lower solar wind speeds including those at sunspot cycle maximum. Others have noted the Nino response to large volcanic events, e.g. Which corroborates the association between weaker solar wind and El Nino conditions. Note that El Nino episodes in 1976-77 and 1986-87 were in the year of sunspot minimum, while 1997-98 and 2009-10 were in the year following cycle minimum. And this is not hard to see why in the solar wind data. I’d say that it is clear that the ENSO system was responding to a positive Arctic Oscillation regime through 1954-1956, which would suggest a period of stronger solar wind states. Er, you have presented no data whatsoever. 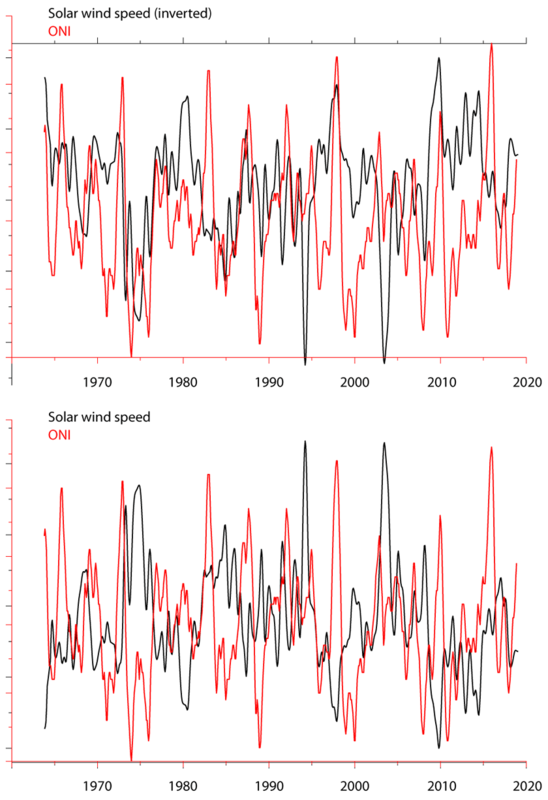 I presented two graphs showing that there is no correlation between solar wind speed and oceanic Niño index. We are not going to take your word for it, particularly since it goes against evidence of no correlation. You cannot make sense of your own graph. It shows lots of correlation between higher SW speed and La Nina, and lower SW speed and El Nino. Do you mean that you actually defend that my graph constitutes evidence of a negative correlation between solar wind speed and oceanic Niño index? I think it constitutes evidence of your bias. The correlation is absurdly low. Have you calculated it, or are you completely detached from mathematical analysis? I have done a fine visual analysis for each El Nino episode with the monthly data, not smoothed. They are all associated with declining or lower solar wind speed apart from two associated with volcanic events, the 1982-83 and 1991-92 El Nino episodes, and the 2015-16 El Nino, which in effect was a continuation of the 2014-15 El Nino, which was associated with lower SW speed. “Fine visual analysis” is just another name for confirmation bias. One should not expect ONI and SW speed to be directly proportional for intensity, as changes in solar irradiance may be working in the opposite direction, as with the 69-70 and 79-80 El Nino episodes. Also the solar wind pressure has weakened over time relative to the speed. 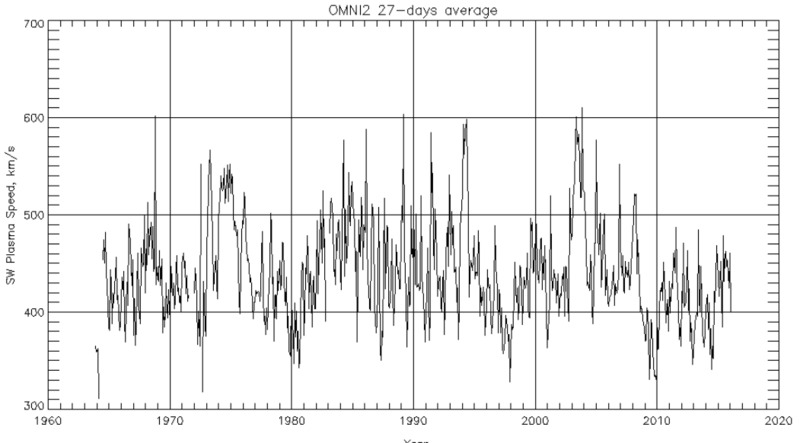 Lags in timing would be variable as ENSO is seasonally fixed. A finer correlation for timing would be found with the solar wind and the NAO/AO. Your insinuations are very much out place when considering that only I found fatal errors in a number of your graphs in your series of posts on this blog. The MEI captures the mood of the tropical Pacific – something that perpetually shifts between modes with periodicities from years to millennia. In the language of chaos there are strange attractors in the system state space. ENSO starts with upwelling in the eastern Pacific and there are physical links between polar vortices, flows in the Peruvian and Californian currents, shoaling of the thermocline and upwelling. Then there are feedbacks with planetary waves reflecting off margins in a resonant system. There seem to be connections between solar activity and polar vortices. But even if statistical significance were possible with these periodicities and the data we have – correlation is the wrong way of thinking about it. It is more like an avalanche – a pebble moves and the cliff collapses. In the terms of chaos theory – there are control variables that ultimately with a little more change push the system past a threshold and the mood of the Pacific changes. If there were errors that is good. That is what peer review is for, and that is the idea behind publicly posting something, that its errors can be found and corrected. For that I thank you. But that doesn’t detract from you seeing things that aren’t there. What you are saying about solar wind speed and ENSO would not get past peer-review. And any reviewer would tell you what I tell you, only perhaps in a nicer way, or not. Note that the three strongest periods of solar wind, in the early-mid 1970’s, mid 1980’s, and early 1990’s, correspond to the three coldest AMO periods. Yet you cite work on WUWT which notes an association between weak solar wind and El Nino near sunspot cycle minimum. Hmmmm? The La Niña ‘normal’ emerges through a shallow thermocline as deep, cold and nutrient rich water upwells in the eastern Pacific. Differential convection over cold water in the east (high surface pressure) and warm water in the west (low surface pressure) strengthens trade winds over the tropical Pacific. 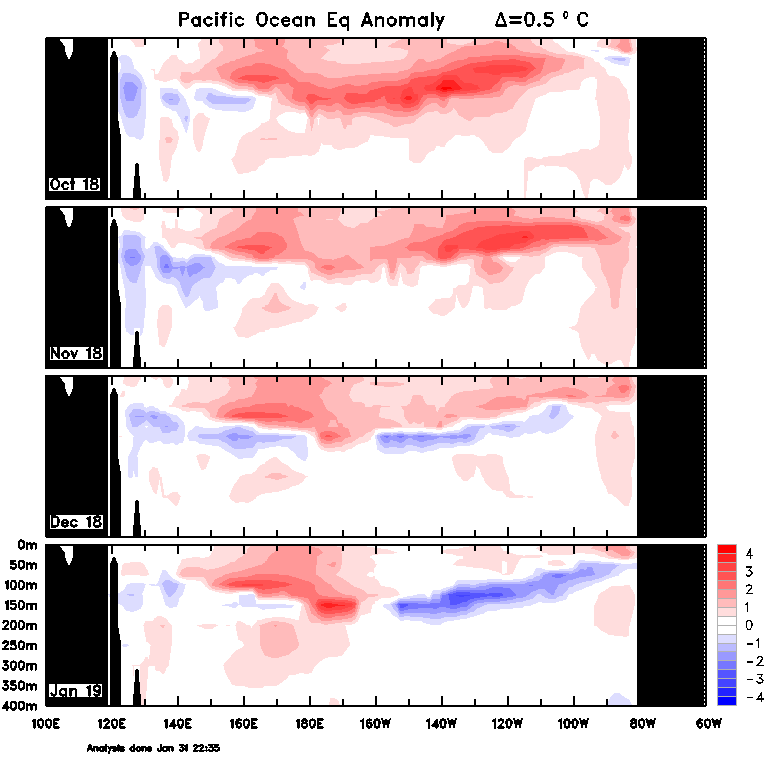 Stronger trade winds pile warm surface water up against Australia and Indonesia in the ENSO recharge phase. At some stage the trade winds falter and warm water surges eastward in an El Niño – the discharge phase – deepening the thermocline and suppressing upwelling. Shoaling of the thermocline in the east has evolved over the past few months. Should trade wind feedbacks kick in – the next La Niña in on the threshold. Thermocline shoaling is caused by winds and oceanic gyres that converge at the equator and – on a spinning planet – turn west. Winds can be seen in the near real time supercomputer simulation from earthmullschool. Wind and wind driven currents off the coasts of Peru and California are driven by the polar annular modes. These vortices from the surface to the stratosphere at the poles are caused by planetary spin but with the ‘waviness’ modulated by polar surface pressure. The coupled atmosphere/ocean ‘gyre hypothesis’ has implications for the PDO and ENSO – but also for Atlantic heat transport, the AMO, AMOC and ice sheets. The polar modes may be influenced by solar variation. There is an ENSO transition from a phase locked La Niña state to El Niño dominance some 5,000 years ago – seen in the Moys et al ENSO proxy – coincident with the drying of the Sahel. It is coincident as well with the mid Holocene transition from low to high solar activity seen in the cosmogenic isotope record. There were El Niño phases in the medieval climate optimum and the modern period and an intervening La Niña phase seen in the Vance et al proxy. 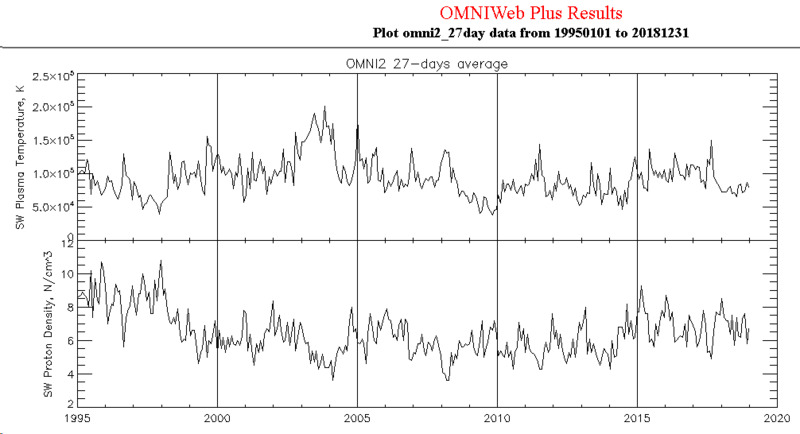 Coincident with high and low solar activity again seen in the cosmogenic isotope record. 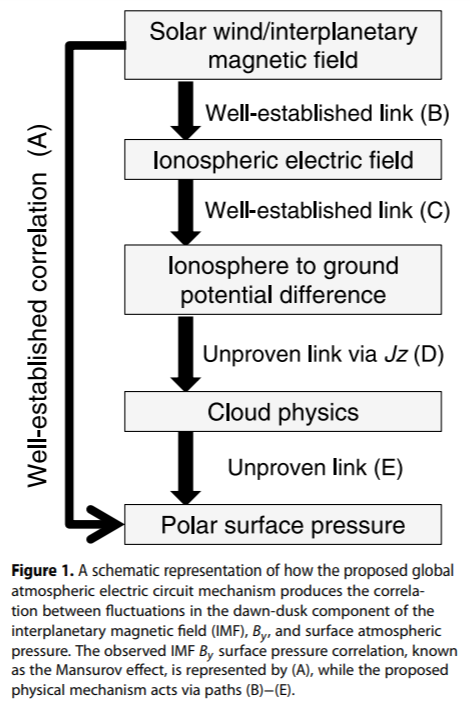 The mechanism may be solar winds, the global electrical current and the Mansurov effect – or UV/ozone chemistry in the stratosphere translating to polar surface pressure through atmospheric pathways – or both. Either suggests a source of roughly 20 to 30 year periodicity in the system in the Hale cycle of solar magnetic reversal. But there is no law of geophysics enabling prediction of ENSO – or anything else much – in the Earth system. Models rely on persistence and are very poor at picking ENSO transitions. Mojib Latif declared that skill in predicting 20 to 30 year Pacific state transitions is about the same as tossing a coin. LMAO. You’re making stuff up. I posted the forecasts of forecasting organizations like BoM and IRI. Professor Curry posted her forecast for an El Niño, which you can go read. The cheerleading at the time was for a continued La Niña, and I made fun of that anchovy ridiculousness. And what does that have to do with current sea level rise being weak? There are fundamental ENSO dynamics. The playlist here is an excellent introduction. 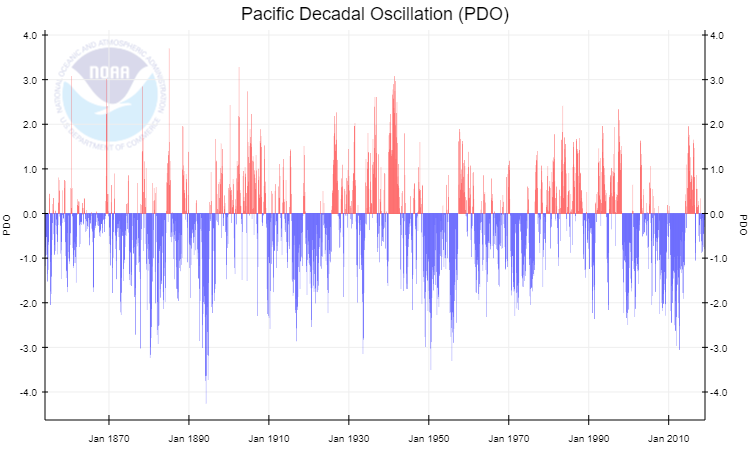 Multi-decadal variability in the Pacific is defined as the Interdecadal Pacific Oscillation (e.g. Folland et al,2002, Meinke et al, 2005, Parker et al, 2007, Power et al, 1999). 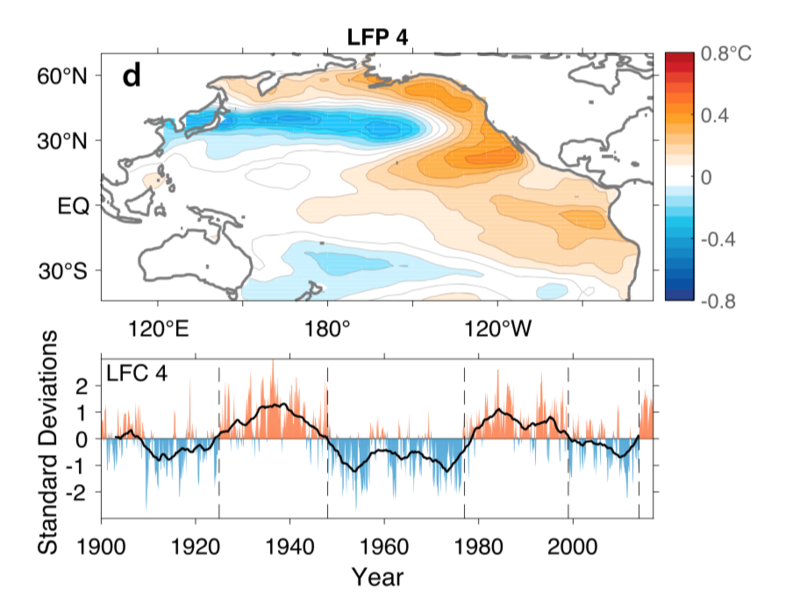 The latest Pacific Ocean climate shift in 1998/2001 is linked to increased flow in the north (Di Lorenzo et al, 2008) and the south (Roemmich et al, 2007, Qiu, Bo et al 2006)Pacific Ocean gyres. Roemmich et al (2007) suggest that mid-latitude gyres in all of the oceans are influenced by decadal variability in the Southern and Northern Annular Modes (SAM and NAM respectively) as wind driven currents in baroclinic oceans (Sverdrup, 1947). The references can be found here. The gyre hypothesis is explicitly defined here. “The four-month sequence of sub-surface temperature anomalies (to January) shows warm anomalies across most of the top 200 m of the western half of the equatorial Pacific sub-surface, and cool anomalies in the sub-surface of the eastern half, rising from about 150 m depth in the centre, to just below the surface in the very east of the basin. 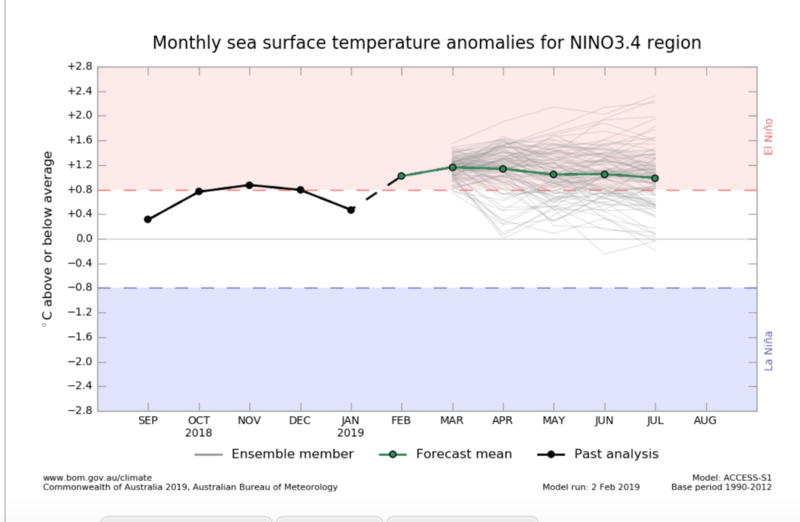 Warm anomalies in the sub-surface have decayed over late 2018 and early 2019, although small parts of the sub-surface to the west of the Date Line remain more than two and a half degrees warmer than average.” BoM ENSO wrap – current. A shoaling of the thermocline in the Eastern Pacific as I said. My thoughts at the time of Judith’s ENSO post – and they are there in black and white – is that there was insufficient recharge since the 2015/16 El Nino in the western Pacific to support a sizable El Nino – and that any departure from the neutral state at the time of any significance was likely to be La Nina. This is still the case – but now with incipient La Nina sub-surface temperatures at a time of year when departures are more likely. JCH is typically all over the place with little fundamental understanding of ENSO geophysics. It’s not clear what his comments signify – if anything. Or indeed what such tiny windows on SLR as Javier’s can realistically tell us. La Niña will save the day! Just around the corner. A biggun, Gonna punch the daylights out those evil alarmists. Soon. Pray, and it will come. I try to be informative on the geophysics. They do come in pairs – a boy child and a girl child. La Nina will cool the planet – oceans and atmosphere – a little and El Nino’s warm. And no matter what JCH will sing off key his poorly considered, angry little progressive, lonesome cowboy – with the family oil money – tirades. Google latest positive phase of the PDO. LMAO. Again with this nonsense? And a shifting goalpost fallacy?Even within regimes of 20 to 30 year of more or less upwelling in the north eastern Pacific – it is clear that there are interludes of opposite sign. It is not clear that the Pacific state has shifted again. Nor is it clear that the next shift will be to warmer sea surface states. When you were saying the negative phase of the PDO that started around 2000 was going to last decades. I told you it likely was not, and your little insecure disordered defective personality can’t deal with because you’re a loser. The difference is that there is such a wealth of science on the mysterious 20 to 30 year – and longer – Pacific periodicity. While you have the most superficial and motivated of graphologies, a foul mouth and angry little rants? When they talk about records set in recorded history, they are talking about the most recent 100 years and a little more after we started measuring with thermometers and recording the data that makes up “RECORDED HISTORY”, as we came out of the Little Ice Age. It was colder in the Little Ice Age and out of it until now in our Modern Warm Period. Ah, most people don’t seem to understand that the chances of Niño/Niña are heavily affected by ENSO’s capacitor role. RIE does understand it. That’s why they come in pairs. A Niña is unlikely with the capacitator recharged and an El Niño is unlikely with the capacitator discharged. After the big 2015-16 Niño only partial recharging was accomplished due to weak La Niña conditions and low solar activity. That’s why a big Niño is not possible now, and current conditions don’t qualify as a full Niño. But current conditions are of net discharge which means a stronger Niña is in the cards for the near future. 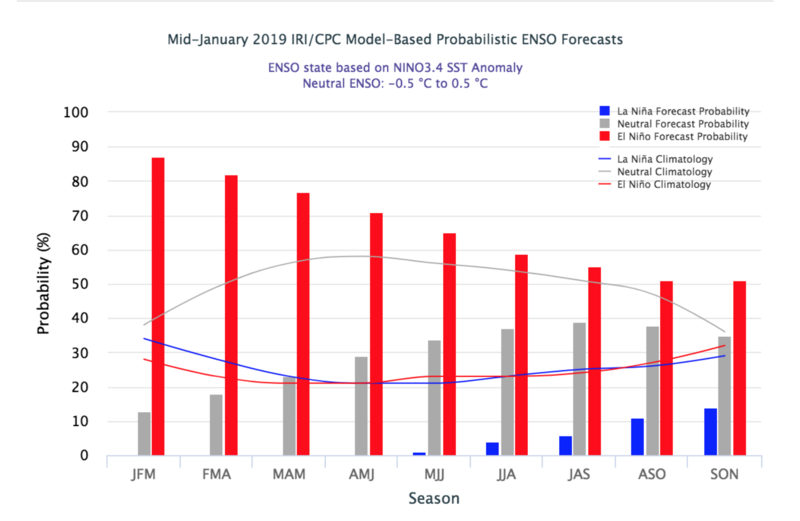 La Niña conditions will have to be established by the time solar activity reaches 35% of maximum, but the expected Niña could start earlier, as in 1954 and 2010. One critical issue to predict ENSO at this time of the solar cycle is being able to predict the solar minimum. Not an easy task. My opinion is that the solar minimum is taking place right now. Other people think it will take place next year or the following. I think they are mistaken. After the summer we will have a clearer view. Regarding sea level rise, we have entered a phase in the 65-yr oscillation that instead of adding to the rise it subtracts from it, and for the first time since 1900 the low in the 65-yr oscillation coincides with a low in solar activity. The consequences should be fully expected by experts but they will become as completely unexpected because the experts are looking at the finger, not at the Moon. Sea level rise is decelerating for a period of a couple of decades. It will make every expert prediction of 21st century sea level rise completely wrong, except the highly criticized and superseded IPCC B1 scenario. Given the relationship between sea-level rise rate and ENSO we are facing a period that will continue seeing more Niñas than Niños and that will result in moderate cooling over time, resulting in no net warming over the first quarter of the 21st century. Not precisely what the CO2 hypothesis predicted. Fascinating. Setting aside the debate about the relative strength that any of these oscillations might have, this is a good reminder of how many are in phase or out of phase ( if that is a correct description) and how those interrelationships can affect parts or all of global climate at any particular time. The Beast is really trying to disentangle all these counteracting forces. Or there were weak La Nina conditions because solar had picked up a bit, and then solar fell again in 2018 leading to El Nino conditions. An ENSO prediction from Javier is an unexpected treat — remember kids, real theories make predictions. Will bookmark. I have not read a lot about the capacitor effect before now but it seems plausible. Will be fun to watch. I’ll take you up on this, Javier. Notice I said “net warming trend,” Javier. So that means not picking just the starting value at 2000 and just the ending value at 2024 or 2025. One needs to calculate the trend over the 2000-2024 and 2000-2025 period. But in case that’s not OK with you, then I include in my prediction that the 2024 and 2025 values for categories 1 through 6 above will be greater than the 2000 values. By this I mean that temperature or heat content will be greater in categories 1 through 4, ice levels will be lower in category 5, and sea level will be higher in category 6. A quarter of a century is shorter than the typical climate period of 30 years. But it should still suffice for addressing your point. We can use the most updated versions of whichever analyses are available in the 6 categories I mentioned above. So, for instance, no cherry-picking just the UAH analysis for point 4, particularly given its long track-record of errors dating back from the 1990s to the present. If I’m wrong on in my prediction, then it should undermine whatever credibility I have when discussing climate science. If you’re wrong in your prediction, then sensible people should not take you seriously on climate science, especially given your track-record of distortions on the topic. So it looks like we can mark the end of 2024 or 2025 as when sensible people should stop taking one of us seriously. Maybe then Judith Curry will no longer have you make so many non-peer-reviewed blog posts that distort the science? I just copied this elsewhere. Low frequency variability is an appreciable component of 20th century surface warming in both hemispheres. 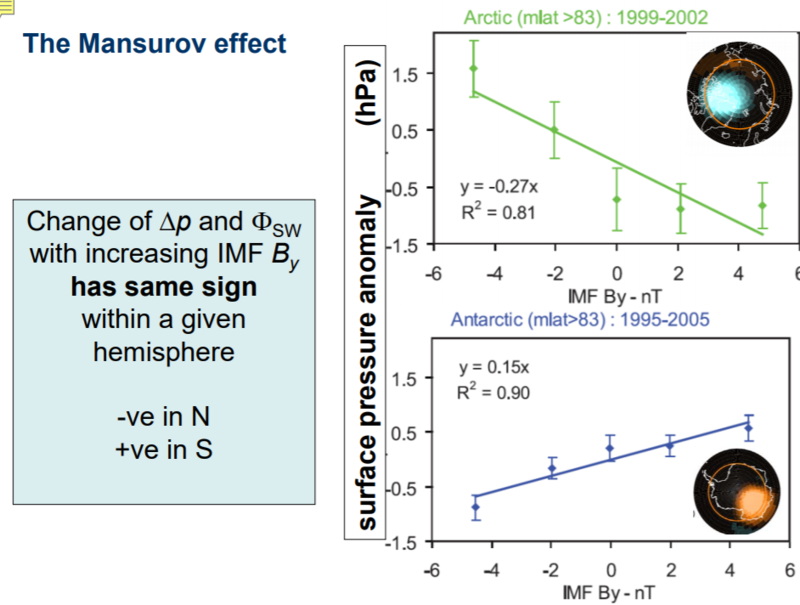 Polar surface pressures are modulated by solar activity in the Mansurov effect. This drives meridional or zonal wind patterns that spin up gyres more or less in all the world’s oceans. The climate future depends to a large degree on solar evolution this century. That’s not predicable in detail – but a decline from the modern solar max is looking more likely than not. 3 years doesn’t mean a flipping’ thing. Based on your arrogant attitude about your skillful predictive powers, you apparently think sea level typically continues to rise after a powerful El Niño ends. Perhaps you can point out an example of that happening in the satellite altimetry record. Lol. That’s the BoM probabilistic ensemble – 32 runs of their new ACCESS model. It shows 50% chance of El Nino and 50% neutral. Trouble is that they are coming up against the spring predictability barrier – when things tend to change. And poised to change they are. He attaches some meaning to this – but it is clearly neither balanced nor objective. LMAO. IT;s from them. It’s not me you stupid phukk. How did he misunderstand? It is he who is not balanced or objective quite obviously. Unless they are 3 years of warming in which case they become evidence of global warming worsening. The deficit in sea level rise over the past 3 years has to be made up by a bigger sea level rise in the future, as otherwise sea level rise is decelerating. As when I said years ago that the September Arctic sea-ice extent was in a pause, it is just a question of letting every year come with a new data point that confirms it. Making predictions that test hypotheses is the only way to know how correct they are. IPCC made a huge glaring error when it decided to ignore the 65-yr oscillation. Its contribution reduces CO2 role and thus dilutes the message. But ignoring it means having to deal with the problems caused when climate change does not go in the predicted direction. The loss of credibility cannot be undone. All interesting papers. I’m not so sure that the reason the Whitehouse paper has gotten zero play is because the details of the broader climate implications are buried in the paper. The cynical view is that no one in the cheerleading crowd wants to go against the current. What fun is it to provide a little balance to the debate. No one except honest scientists are incented to provide all the facts. Since we are coming up to the 30th anniversary of the first IPCC Report, I wonder if it’s time to do a retrospective grand paper on all of the findings which were either discovered or better constrained since 1990. Sort of like in golf. If you made a mistake on the first shot, you get a mulligan. Scientific knowledge is certainly in better shape than it was thirty years ago. And the credibility of Climate Science takes another hit as another SLR ‘wolf’ turns out to be a poodle preened and presented to try for ‘best in show’. Warm thawed Arctic Ocean is necessary to get evaporation and snowfall that rebuilds ice on Greenland. Warm thawed Oceans around Antarctica is necessary to get evaporation and snowfall that rebuilds ice on Antarctica. Warmer oceans will rebuild the sequestered ice faster, this is a stable well designed cooling system for the polar regions in both hemispheres. Warm times are normal, natural and necessary to cause increase in ice volumes and ice flow rate and ice thaw rates to cause colder times. This is well documented in ice core data and history. Sea Level Rise will stop and reverse in this century. We will not live to see the end of this but we are seeing the beginning of this now. Warm Arctic and snowfall from Polar Vortexes are rebuilding sequestered ice in the Northern Hemisphere today. Not if we consider that the economic impacts of even 0.5 m or 1.0 m sea level rise are relatively insignificant. The projected global economic impact of ea level rise is negligible compared with the other impact sectors. The damages estimates of global warming are dominated by the cost of sea level rise. These high costs damage assessments result from models that assumed Humanity will not adjust to a higher rate of sea level rise once it is demonstrated. I think you may have misinterpreted the numbers. Sea level rise is a negligible impact. ❶①❶① . . . Is Tamino stupid? . . .
Tamino is a funny little man. He likes to produce graphs which show how stupid Deniers are. But what are we meant to think, when Tamino produces graphs like the following ones? Is Tamino trying to show that Alarmists are just as stupid, or possibly more stupid, than Deniers are? My advice to Mr Tamino (which he will probably ignore), is that when you want to prove that somebody is stupid, don’t do something that is even stupider. Mr Tamino seems to belong to that group of people, who believe that any warming is “global warming”, but that any cooling is just weather. Mr Tamino, you may now take your foot out of your mouth. And you should get those self-inflicted bullet holes in your feet looked at. I looked for the average thickness of an Iceberg breaking off Antarctica and it said it was 2.16 kilometers. The Vostock Ice Core says that the new Ice Age began 18,000 years ago. Since then 250 meters of Ice has been added. This means that 1/8th of the Iceberg has to be reevaporated and dropped at the poles. I assumed the amount of heat lost by the earth to the black sky is constant because NATURE is keeping the surface temperature of the earth constant. The percentage of new ice in the ice shelf keeps getting higher and the amount of Ice breaking off will keep getting smaller each year. Eventually the level of the oceans will begin to drop. Predictions of, “really catastrophic sea level rise scenarios,” apparently are the latest ‘hockey stick’ science of the 21st century, telling one thing we can be sure of– either the polar bears are no longer in danger is extinction or… no one cares anymore. 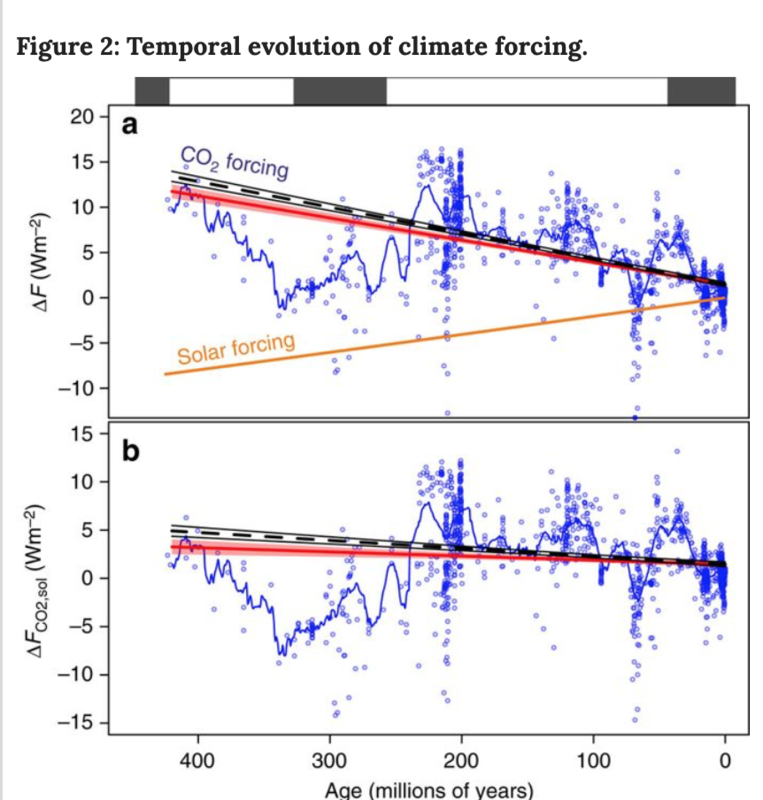 I haven’t fully read all the papers, but how do you feel tipping points are addressed and how external forcings (thermal expansion, accelerating glacier movement/sliding (lubrication of the ice sheet/ice wall buttressing- can these be modeled? ), surface mass balance (snowfall minus melting + sublimation) might impact predictions? They will continue to develop models that attempt to predict dynamic behavior of ice sheets. One additional bit of perspective. What’s the latest estimate of Antarctic ice melt to sea level rise over the past 40 years? Cummulatively? It’s 14 mm https://www.pnas.org/content/116/4/1095. Since 1979. Wake me up when it triples. Reblogged this on Quaerere Propter Vērum. the improbability of any fundamental law of Earth system geophysics – the silence on 21st century evolution of climate would be deafening. Although nature abhors and we can depend on silence being filled with the clamor of cranks. ❶①❶① . . . The Science and Mathematics . . .
❶①❶① . . . . of Earth’s Temperatures . . . .
PART 2 has just been published. In Part 2 of this article, I will show some graphs which show how accurate my temperature model of the Earth is. I will then reveal the secret of why my temperature model of the Earth is so accurate, but also very simple. The reason is, that I have separated the temperature estimates from the actual latitude of a country, and based the temperature estimates on the “effective” latitude. See the article for a practical example, and a detailed graphical explanation. General information about the series of articles. That would have to be a big, complex temperature model, wouldn’t it? I am sure that many people will expect my temperature model of the Earth to be very inaccurate. You are welcome to have a look at the results of my temperature model of the Earth. A hollow earth model also fits data, and observed sea level rise fits thermal expansion. If the ice sheets completely melted, there would be zero extra rise, since the spacetime curvature inside is 0, so water goes there instead. I don’t understand how intelligent scientists are scared of Antarctic marine ice cliff instability. The instability is due to the ice flow dynamics on Antarctica. Without it, i.e. outward flow of glacial ice, the impossible would be the reality – Antarctica would become, not top heavy but the opposite, with excess ice adding more mass to Antarctica. How high would it grow??? Ice is mobile under sufficient pressure (say a load of a few hundred meters of ice will become plastic AT THE BOTTOM) it will flow downhill under gravity. All calving on Antarctica is due to ice flow. It should also be noted that the waters around Antarctica are not warm, on the contrary they are cold (temperature under one degree Celsius) but cannot “melt” the ice, however, the high salinity causes ice in the water to dissolve. This can be seen by anybody with eyes open at the edge of a seaward flowing icetongue or cliff, seeing small flakes of ice forming in the adjacent open water. This I have observed several times at the edge of stranded ice in the Weddell Sea. Commented on SLR, the closure requirement and Antarctica glaciers here several times before. Nice to see a little reality beginning to intrude into the alarmist SLR memes. Pingback: Sea level rise whiplash | Watts Up With That? Reblogged this on pdx transport. Regardless of how many times I have made a google search on this topic related to Antarctica, I’ve never turned up as many citations as that in the Whitehouse paper. Not even close. The 160 papers referenced in Whitehouse is a mother lode of great reading material. They all cover such interesting topics. Just another reminder that peeling away the onion skin in this arena just turns up more onion skins. DeConto and Pollard cannot comment on this paper. Antarctica has been around for many millions of years, we have 800 thousand years of ice core data and we know there was ice millions of years before that. Data shows the sea level extreme drops and rises were mostly caused by the huge increases and drops in the Northern Hemisphere while Antarctica accumulated more ice and gave back only part of in any cycle and mainly contributed to the sea level drops. It is really cold in Antarctica, when Antarctica receives more ice, Antarctica keeps most of it. There is no reason to believe any warming will change that because data shows it is warming that increases the ice on Antarctica. For Antarctica to lose significant ice, the oceans would need to be cold and frozen and stop evaporation and snowfall for a really long time. Sure, people care about claims of multi-meter sea level rises…. especially when it is claimed that could happen within the lifetime of a person’s children. Alarming projections of warming and its consequences, all impossible to prove or disprove, have been regularly hyped since the days of the late Stephen H. Schneider. “Marine ice-cliff instability” is just the latest of these alarming projections. There is no reason to think that is going to change any time soon. 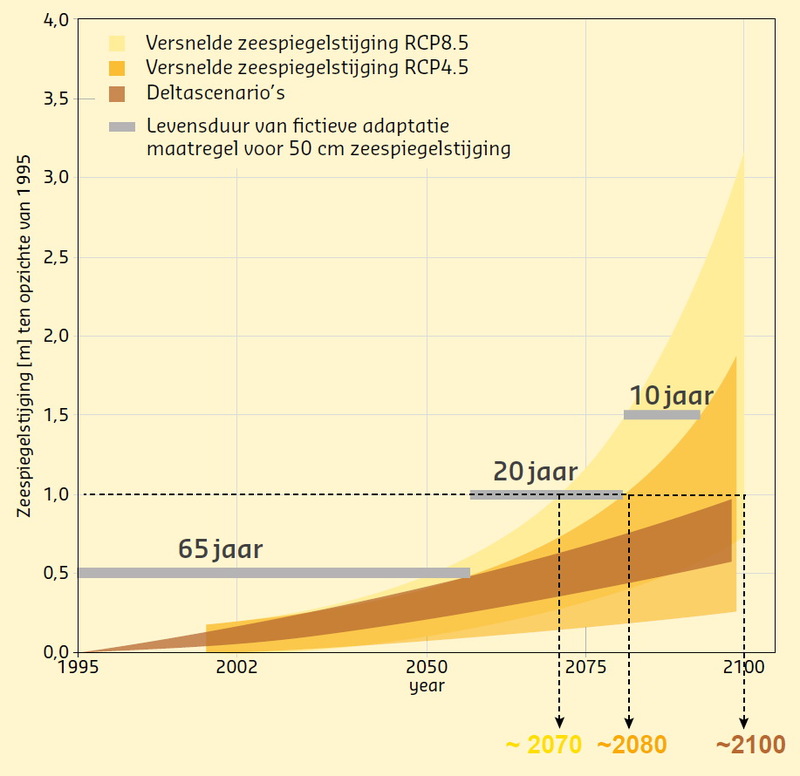 Judith, Dutch organisation Deltares claimed a 3.5 meter rise at the end of this century under RCP 8.5 following DeConto and Pollard, how do these numbers change now? They increase sea level with warmer temperatures. Ice core data increases ice accumulation with warmer temperatures. One of these is true and one is a lie. One of these is documented in ice core data and one is documented in computer model output. I will go with actual data. When it is warmer, oceans are more thawed and evaporation and snowfall and sequestering of ice on land in cold places does drop sea level. It has been warmer than now multiple times in the most recent ten thousand years and this has never happened. If warmer must cause crazy, chicken little, sky is falling, sea level rise, why did it not happen in past warmer than now times? No one is actually studying actual data. Ice core data shows that ice accumulation on Antarctica and Greenland require warmer oceans with more evaporation and snowfall. The warmer it gets the faster the sequestered ice will be replenished. This will drop the sea levels and cause cooling later after the more sequestered ice flows faster and does cooling by more reflecting and thawing. Warmer is considered a disaster, but warming is necessary to rebuild sequestered ice. This is how natural ice cycles work. It snows more when oceans are warmer and more thawed and ice advances after that and causes colder. It snows less when oceans are colder and more frozen and ice depletes and retreats after that and causes warmer. It is nautral cycles and we do not cause them with a trace gas. Riiiight. The anthropic principle at its best. We are here because by a cosmic coincidence the increase in solar brightness was exactly matched by an unrelated decrease in CO2. Must have been God controlling CO2. CO2 and temperature have correlated with a lag of CO2 changing after temperature and other times when they were not correlated at all. The oceans are a huge carbonated drink and a hot coke spews more CO2 than a cold drink, everyone knows that. Temperatures on earth are colder when there is more ice extent and warmer when there is less ice extent. Colder oceans support lower vapor pressures of CO2, warmer oceans support higher vapor pressures of CO2. This is simple basic grade school science and common sense if you have ever opened a warm and a cold carbonated drink. Sun worshipping and navel gazing. Navel gazing and sun worshiping. Not sun worshipping and navel gazing, actual real data worshipping and study of what really happened in written history. Warm periods followed cold periods and cold periods followed warm periods. These cycles are normal, natural and necessary. Pingback: Weekly Climate and Energy News Roundup #347 | Watts Up With That? I say the new ice age began about 18,000 years ago. At that time the oceans began to drop; The ice was depsited at the poles. As the ice built up on the ice shelf, the 39’F water was still eating up twords the continent at the bottom of the shelf. This is shown in the Antarctic ice corre. I guessed the Ice began breaking off about 15,000 years ago. The new ice plus the old began to raise the ocean level. ❶①❶① . . . Temperature and Population by Country . . .
How many people will die, if we reach the +2.0 degrees Celsius temperature limit? It is difficult to give an accurate number, because it is a totally new situation. But I have found a way to estimate the number of deaths. It took quite a bit of work. But in the end, the answer was obvious. The answer is so obvious, that I am not going to tell you the answer. I have done all of the work so far. It is about time that you pulled your weight. Don’t worry. I am only asking you to look at a graph. Do you think that you could manage that? This is the only graph that you need to look at, to fully understand global warming. It even comes with a money back guarantee. I understand why you have gone for the global warming impact but surely the main causes of death/wellbeing in future will relate to the ability of the country to feed/water their burgeoning populations? The point I want to make is that many countries, such as Syria, Nigeria, Ethiopia and Iraq have seen their population double or triple over the last 30 years. As an example look at the stats for Ethiopia at the time of Bob Geldof’s live aid, today and 2050. Truly staggering. The country concerned will need the best and most amenable climate in its history in order to feed and water the numbers coming along. At the time of ‘Live aid’ it had a population of around 35 million. There are around 100 million people now and a projected 190 million by 2050.
it is very difficult to see how undeveloped countries can cope with this sort of increase as you only need a run of bad years-which always happens-and it will be a catastrophe. Tony, I’m not sure you are looking at the right metrics to judge population in say Ethiopia, but I am not sure it matters for your over-arching point. What matters is technological societal improvement which is down to how fast they can improve their political situation. Have you seen Hans Rosling demonstrations on these? They are fantastic and can help put things into perspective. Basically where ever you women in education, and societal improvements in wealth and security that lead to lower infant mortality rates, BR declines rapidly. The reason women in poorer countries have so many more children is because of high infant mortality. Developing agricultural techniques mean there is no need for anyone in the not too distant future to ever be hungry, including the increasing population in Africa. It just depends on a stable society and cheap energy. Yes I am aware of declining birth rate but it is relative, as it is declining from a radically higher population. I agree that the more developed a society becomes the more likely it is for the birth rate to to decline as the death rate for young children declines so the desire for large families to compensate diminishes, better education illustrates the opportunities available to those with smaller families but all sorts of other factors kick in such as better healthcare keeps more people alive and they live longer. however, many of these countries have very limited opportunities for developing their farm products due to lack of water or good land. We are seeing this factor in Nigeria where the settlers/farmers and those herding cattle are clashing violently as their local populations increase rapidly. of course, we also are seeing the migration factor kicking in, so the best and brightest are likely to be looking elsewhere. We saw in Syria the effects of too many people, too little land, limited development, not enough water and where a marginal change in weather, although not to unprecedented levels, caused big problems. What a country can withstand with 10 million people is different to their situation if they have 40 million. As for a stable society AND low cost energy, those are factors that do not often coincide…..
Syria did not collapse because of mass starvation, that was Venezuela. Environmental advocates do not seem to understand that food supplies are fungible market commodities. As Rudy Rummel has documented, virtually the only reason large people have ever starved over the past 100 years is government action cutting off food supplies. Water management is the key to solving many human and environmental problems – including SLR to an extent. But it does require resources. Reblogged this on Climate Collections. – Extent gain 93k, 53k more than the average gain of 50k on this day. – Extent is 9th lowest in the satellite record. Judith, this is a most unusual last 9 months. Wild, wild swings in the refreezing rates from record highs to long lulls and back again. Absolutely unpredictable. it has now surpassed the minimum hit last year and looks on track to post a reasonably high level. At 2 stages in the last 3 months it had dropped back to third lowest and at one stage was 12th or 13th lowest. No one was able to predict such variability. Fingers crossed for an exceptional peak to really toss a cat amongst the pigeons. Magicking SLR by careful mixing of tidal gauge and satellite data sounds like something from Hogwarts wizard academy. Is it from the potions class? Or dark arts? ❶①❶① . . . How hot is that country? . . .
To know how global warming will affect a country, you need to know what the country’s current temperatures are, for the average hottest month, the average month, and the average coldest month. But the IPCC, and Alarmists in general, don’t want you to believe that. They want you to believe that ALL warming is “BAD”. And that ANY warming is “BAD” for EVERY country, no matter what that country’s climate is. Next time that you talk to an Alarmist, ask them if global warming is “bad” for Russia (temperature data for Russia is shown in the article). This article contains 3 graphs, and 1 table. The table is at the end of this article, and lists all 216 countries in alphabetical order, along with the region, population, and temperature of the average coldest month, the average month, and the average hottest month. The 3 graphs each list all 216 counties, along with a bar graph showing the temperature of the average coldest month, the average month, and the average hottest month, for each country. It is fun just browsing through the graphs, seeing the temperatures of the different countries, and trying to explain why different countries have different temperatures. But eventually, you will probably want to look up a particular country (like the country that you live in). Because there are 216 countries, you might find it hard to find a particular country. You can use your knowledge of a countries temperatures, to help you to locate it on a graph. If you live in Kuwait, Iraq, United Arab Emirates, Chad, Qatar, Sudan, Niger, or Pakistan, and you are looking at the graph sorted by the average hottest month, then I suggest that you look at the bottom of the graph (they all have high average hottest months). If you live in Mongolia, Russia, Greenland, Kazakhstan, Canada, Finland, Kyrgyzstan, or Armenia, and you are looking at the graph sorted by the average coldest month, then I suggest that you look at the top of the graph (they all have low average coldest months). If you live in England (which is listed under the country name “United Kingdom”), then I have to say “bad luck”. Not everybody can live in a country with nice temperatures. I am just joking. But United Kingdom actually has the 7th lowest average hottest month temperature (+19.8 degrees Celsius, that is colder than Finland, and Russia). I lived in London for about a year, and I was amazed at how nearly everyone in England gets badly sunburned, whenever there is a sunny day. It is because they don’t get many sunny days, so they like to enjoy them, when they occur. Time to get serious again. You can’t search for a country using the browsers “find” function, because the graphs and the table are all pictures. But there is a fairly easy way to find a particular country. Look it up in the alphabetical table at the end of this article. Memorize (or if you are like me, write down) the temperature of the average coldest month, the average month, and the average hottest month. To find the particular country on the graph sorted by the hottest month, find the countries average hottest month, in the hottest month “continuum”. The country will be near that position, in the hottest month “continuum”. CERES shows shortwave warming and infrared cooling – a low cloud pattern. Short term wiggles in ocean heat – and the surface follows – are dominated by cloud changes in cloud over the eastern Pacific. The overdue recharge phase – La Nina – of ENSO will emerge with baroclinic feedbacks across the Pacific. There has been a recent shoaling of the thermocline in the east. A La Nina will cause cooling of both oceans and atmosphere – and what matters is the long term evolution of these wiggles? Where us Al Gore and his predictions of twenty foot sea rise on the way? When he came out with it that much rise was an obvious fantasy. I decided ti measure my own and based it upon the last eight years of sea surface measurements available then, It came out as a shade under ten inches, not 20 feet as Al claimed. Clearly the world’w premier science journals, Science and Nature,, had to be notified. I sent a letter to each and guess what? Both journals turned it down, apparently without even reading it. So what happened in the end? Al Gore got a Nobel Prize and I remained an unknown interloper. Since then I have seen various predictions for sea level rise, the majority more than ten inches. I have seen nothing to change my mid about the original prediction which I made more than eight ears ago. I am willing to bet that when the final measure is in it will be very close to ten inches per century as I predicted then. All of the above studies simply assume the models are right I take it (the very thing that first needs to be proved, or the models improved). The ‘ice cliffs’! These are glaciers that have met and mounds have been created at the water’s edge. The rest of the glaciers of the poles has an altitude of less than 3 feet! 90% of the ice is submerged and only 10% emerges. Remember that every day there are millions of cubic acres of water (rain and rivers) flowing into the oceans … without them going up !! WOW ! I think my speech cooled the comments!